Just in case you were confused about whether or not we're currently living in a dystopian future horror fest, the Center for Investigative Reporting has recently found that some doctors under contract with the California Department of Corrections and Rehabilitation sterilized nearly 150 female inmates without required state approvals. The Sacramento Bee reports that according to state documents and interviews, at least 148 women received tubal ligations in violation of prison rules from 2006 to 2010 — and the state paid doctors $147,460 to perform the procedure. What's worse, there are perhaps many more dating back to the late 1990s. 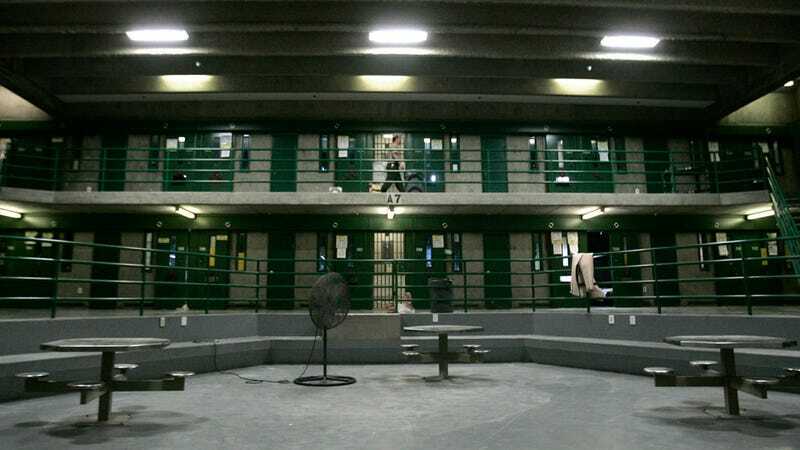 Federal and state laws ban inmate sterilizations if federal funds are used, reflecting concerns that prisoners might feel pressured to comply. California used state funds instead, but since 1994 the procedure has required approval from top medical officials in Sacramento on a case-by-case basis. Yet no tubal ligation requests have come before the health care committee responsible for approving such restricted surgeries, said Dr. Ricki Barnett, who tracks medical services and costs for the California Prison Health Care Receivership Corp.
Not only did the prisons not receive approval from the state, according to former inmates and prisoner advocates, the prison medical staff coerced the women, targeting pregnant women deemed "likely to return to prison in the future". The whole situation is a real mess, with former inmates claiming they were pressured — or witnessed other inmates being pressured — into tubal ligations. Dr. James Heinrich, a former OB-GYN at the now defunct Valley State Prison for Women in Chowchilla, CA, denied charges, and saying he only offered the surgery to patients who has a high chance of having unsafe pregnancies in the future, and that the overall cost of $147,460 was minimal. "Over a 10-year period, that isn't a huge amount of money," Heinrich said, "compared to what you save in welfare paying for these unwanted children – as they procreated more." Not surprisingly, the inmates tell very different stories. Take Kimberly Jeffrey, for instance. The 43-year-old says she was pressured into a tubal ligation while she was sedated and strapped to a surgical table, about to give birth. This, after she repeatedly rejected previous requests from prison medical staff to perform the procedure. "[Heinrich] said, 'So we're going to be doing this tubal ligation, right?' " Jeffrey said. "I'm like, 'Tubal ligation? What are you talking about? I don't want any procedure. I just want to have my baby.' I went into a straight panic." Another day, another step towards living in an even more twisted version of The Handmaid's Tale.